Yesterday I wrote a post arguing that stagnating middle class wages were a partial reason for the increase in borrowing that helped fuel the housing bubble of the aughts. Scott Winship says that can’t be right because, in fact, middle class wages haven’t stagnated. Among other things, Scott suggests that household incomes have actually risen considerably; that CPI is a poor measure of inflation; that fringe benefits like healthcare need to be part of the wage calculation; and that government benefits should also be counted. This deserves a detailed response someday, but in the meantime allow me to revise and extend my remarks a bit with the help of Mike Konczal. Briefly, I think that CPI is still the most reliable measure of inflation we have, that fringe benefits change the picture only modestly (though they certainly ought to be included in any calculation of total earnings), and that government benefits shouldn’t be counted because we should primarily be interested in how the private economy is treating workers, not on what the government is doing to make up for its massive imbalances. My strong preference is for an economy that treats workers decently in the first place, not one in which workers get screwed and we make up for it with lots of forced income redistribution. to stagnate. So what happened then? Mike Konczal provides the chart on the right, which shows us. Household income did rise through the late 90s, but it peaked around 1999.1 And when it flattened out, consumer borrowing started to skyrocket. So the story is revised like this: incomes began stagnating in the early 70s, and the first response was for women to enter the workforce in order to contribute more to household income. 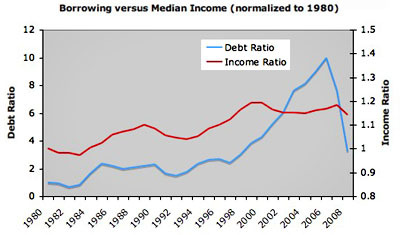 After that dynamic had mostly run its course, the only way to keep incomes rising was to start borrowing more. And that’s what happened. The rich, whose earnings have skyrocketed during this entire period, basically loaned money to the middle class to buy bigger houses and better TV sets, and eventually it all came crashing down. To be absolutely clear here, I’m offering this mainly as a provocation, not as an idea I’m completely wedded to. Nor is it anything like a complete explanation. It’s just one piece of the puzzle — and if you’re interested in this stuff you should be sure to read both Scott’s and Mike’s entire posts. But I suspect there’s something real going on here, and I’d sure like to see some serious economists do some real work on it. In any case, per capita GDP in the United States has increased by about 90% since 1973. I prefer to focus on individual incomes since household incomes are distorted by things like composition and hours worked, but even if you disagree, a 30-40% increase in household income looks pretty anemic compared to the magnitude of overall economic growth. Bottom line: When the rich get too much money too fast, they do dumb things with it, and in the recent past those dumb things were even dumber than usual. We’d all be better off if economic prosperity were more widely shared and the middle class could fund lifestyle improvements out of wages instead of borrowing ever more from wealthy classes with massively growing pools of idle cash. It’s better economics, better policy, and just plain better for the country. 1If you add healthcare benefits to Mike’s chart, it changes a bit. But the basic structure remains about the same.